Small steps add up to big savings when it comes to living a more energy-efficient lifestyle. Although every home is different, one of the most important things to focus on is the energy used to cool and heat your home. For the typical home, heating and cooling costs make up about 50 percent of the average electric bill. The next largest energy consumer in a home is your water heater; water heating accounts for another 20 percent of monthly energy costs. Something else you should know: weather really matters when it comes to energy use. It’s always changing outdoors, heating and cooling your home from the outside in. So even if you never change your thermostat outdoors, energy costs can go up when it’s hot or cold outside. The greater the difference between the temperature outside and the temperature inside your home, the harder your AC/Heating system will work. To narrow the difference between your thermostat setting and the outside temperature outside, keep your thermostat at 68 degrees in winter and 78 degrees in summer. For every degree you raise your thermostat in summer or lower it in winter, you can expect to save about four to six percent on your heating and cooling costs. Consider upgrading an older AC system with an energy-efficient heat pump system. They are especially efficient during cold weather because they utilize “reverse refrigerant” technology—rather than typical heat strips— to warm your home. Heat pumps are up to 30 percent more efficient than conventional systems. Dirty AC filters make your system work harder and less efficiently. Check your filter monthly and change it when it’s dirty or at least every three months. Schedule preventive maintenance for your AC system during spring and fall to ensure it’s running efficiently. A professional can check refrigerant levels, calibrate the thermostat and take care of other things to ensure your equipment is operating as it should. It’s important to have your AC ductwork inspected every few years—especially if you have an older home. If ductwork is loose, crimped or improperly installed, up to one-third of your conditioned air could be leaking into the attic, wasting energy. If you have a permanent window AC unit that isn’t used for heating and is permanently installed, cover the outside and seal around it to prevent cool outside air from leaking in. A new ENERGY STAR® unit can cost up to 10 percent less to operate than an older unit. Conventional tank water heaters cycle constantly—using electricity— to keep water warm and ready. Help it cycle less by setting the tank temperature to the recommended setting of 120 degrees. Use less hot water. Take shorter showers instead of long, hot baths. Wash clothes in cold water whenever possible. And make sure you have a full load of dishes before running the dishwasher, using energy-efficiency settings if available. Repair water leaks and drips. They add up to gallons of water wasted daily and can trigger your water heater to replace it by heating more water unnecessarily. Consider upgrading your conventional tank water heater to a heat pump water heater. These energy-efficient water heaters use up to 70 percent less energy because they use technology, not heating elements to heat water. School your kids to use less energy, especially when they’re home during summer and winter breaks. Ask them to turn off lights and ceiling fans when leaving a room; turn off unused TVs and video games; keep doors to the outside closed; and not change the AC thermostat. When on vacation, a home still uses energy and responds to weather conditions. Although usage should be lower, energy is still being consumed by refrigerators, pool pumps, cable boxes, water heaters, AC/Heating systems and always-on electronics. So, unplug what you can, turn the AC up in summer (down in winter) and put lights on timers or install ones with sensors. Learn more about your energy usage by tracking it with SmartHub, GVEC’s self-service portal and app. Learn more here. Let us help you find ways to make your home more energy efficient. 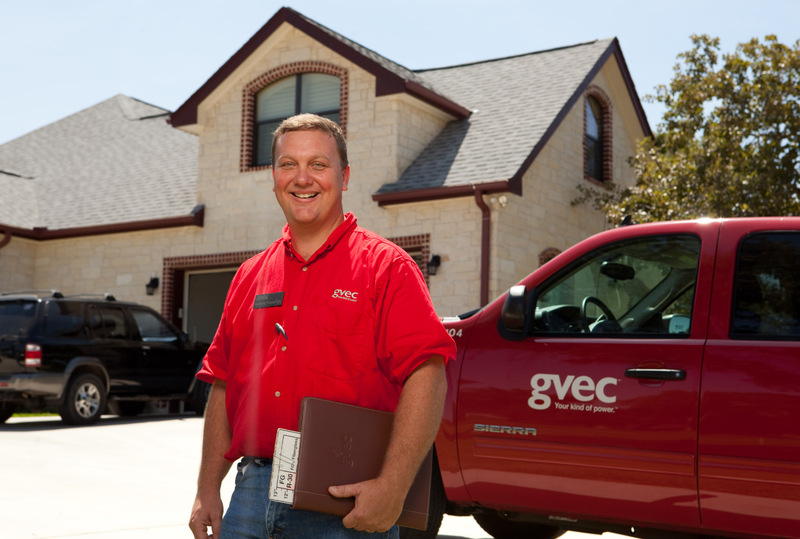 Call a GVEC Member Services Advisor for a FREE Home Energy Audit. Learn more here. Get inspired to make energy efficiency upgrades for your home. The GVEC Energy Efficiency Rebate program can help offset some of the cost. Read more here.